AP GO.29 AP Schools, Staff, Teachers posts Rationalization Norms, New Guidelines 2017. G.O.MS.No. 29, Dated: 22-05-2017 AP Teachers, AP Schools staff rationalization norms, AP Primary, UP, High schools rationalization guidelines and norms, AP Schools and Teachers rationalization guidelines, One class-One teacher. 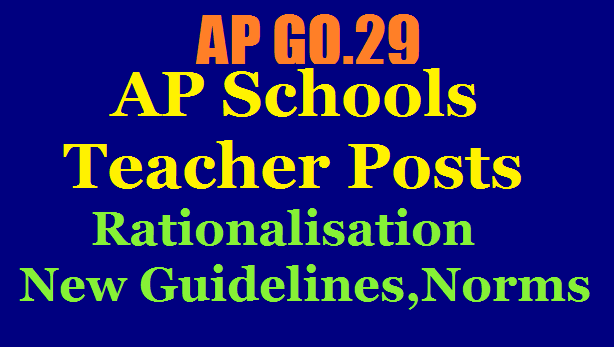 AP GO.29 AP Schools, Posts, Staff(Teachers) Rationalization Norms/Guidelines: Norms for Rationalisation of Schools, Posts and Staff under various managements (viz.) Government, Zilla Parishad, Mandal Parishad Schools in AP. GOVERNMENT OF ANDHRA PRADESH SCHOOL EDUCATION (SER.II) DEPARTMENT School Education - Norms for Rationalisation of Schools, Posts and Staff under various managements (viz.) Government, Zilla Parishad, Mandal Parishad Schools – Orders - Issued. managements (viz.) Government, Zilla Parishad, Mandal Parishad Schools – Orders - Issued. 1. G.O.Ms.No.55 Education (Ser.III) Department, Dated:23.04.2011. 2. G.O.Ms.No.61 Education (SE-SER-III) Department, Dated: 16.05.2011. 3. C.S.E.Lr.Rc.No.25/Estt-III/2015, Dated:30.06.2015 addressed to Government. 4. G.O.Ms.No.39- 51, Education (Ser.II) Department, Dated:07.08.2015 pertains to respective districts. 6. C.S.E.Lr.Rc.No.4102/Estt-III/2015, Dated:26.04.2016 addressed to Government. 7. Govt. Memo.No.228816/Ser-II/A2/2016 School Education Department, Dated:19.05.2016. 9. Lr.Rc.No.4102/Estt-III/2015, Dated: 10.04.2017 addressed to Government. 16.05.2011 have issued norms for Rationalization of Schools, Posts, and Staff under various managements (viz.) Government, Zilla Parishad, Mandal Parishad, Municipal Schools. It is found that, there are still some schools with higher student strength vis- à-vis the sanctioned teaching posts and on the other hand there are some schools with uneconomic strength of students having more teachers. 2) During 2015, based on the Working Group recommendations, positive consolidation of the primary schools and establishment of Model Primary Schools was taken up. Government in G.O.Ms.No.39 Education (Ser.II) Department, Dated:07.08.2015 to G.O.Ms.No.51 Education (Ser.II) Department, Dated:07.08.2015 read with G.O.Ms.No.86 Education (Ser.II) Department, Dated:03.11.2015 to G.O.Ms.No.98 Education (Ser.II) Department, Dated:03.11.2015 issued orders indicating norms for Establishment of Model Primary Schools in the State. 3) Further, vide reference 5th and 8th read above, a Committee was constituted to study and suggest revision of rules issued in G.O.Ms.No. 55 Education (Ser.III) Department, Dated 23.04.2011 and G.O.Ms.No.61 Education (SE-SER-III) Department, Dated 16.05.2011. 4) The Committee suggested revised norms taking a realistic approach, RTE norms, subject weightage, allocation of periods, workload, accessibility, viability of schools, present sanctioned strength etc. The Commissioner of School Education Andhra Pradesh in the reference 9th cited, requested the Government to issue orders based on the recommendations of the Committee. Further, certain suggestions were received from the Hon'ble M.L.Cs and Teachers’ Unions at a meeting held on 04.06.2016. 5) After careful examination of the Committee Report, the additional proposals of the Commissioner of School Education, Andhra Pradesh, and in supersession of the orders issued of the norms and the guidelines in the reference 1st and 2nd read above, Government hereby issues the norms and guidelines annexed to these orders. Necessary Rationalization of the Posts / Teachers in Government / Zilla Parishad and Mandal Parishad Schools shall be taken up based on the integrated U-DISE Data. 6) The District Level Committee chaired by the District Collector shall undertake the Rationalization of schools exercise. 7) The Committee is competent to rationalize the Teacher Posts / Teachers in the Schools under Government / Zilla Parishad / Mandal Parishad as per the norms and guidelines issued as a part of this G.O. 8) The surplus teachers will be first utilized by the Department for ensuring deployment in those schools where there is a deficit as per student teacher norms, then for strengthening academic monitoring, improving quality education in schools, work adjustment in long leave vacancies, to meet the needs of vacancies of instructors’ posts in Teacher Education Institutions, etc. This exercise can be done by the Commissioner of School Education through work adjustment method at his / her level, if required, during the academic calendar year. 9) It is clarified that on account of this Rationalization there shall be no creation of any new posts nor reduction/abolition/surrender of the sanctioned posts. Transportation facility shall be provided for any consolidation resulting 3 km or more travelling for UP and High Schools and 1km or more for Primary Schools. 10) The Commissioner of School Education, Andhra Pradesh shall issue time frame and further instructions on the implementation of these orders and complete Rationalization exercise at the earliest. Any clarification/modification if required for effective and proper implementation of this order, Commissioner of School Education would be competent to issue such orders of clarifications/modifications. (i) Allocation of Teachers to Primary Schools shall be on the basis of norms indicated in Table-1. (ii) Consolidation of Primary Schools and creation of Model Primary Schools may be taken up as per G.O.Ms.No.39 Education (Ser.II) Department, Dated:07.08.2015 to G.O.Ms.No.51 Education (Ser.II) Department, Dated:07.08.2015 (pertains to respective districts) based on the integrated U-DISE data. All such Model Primary Schools shall be allocated 5 Teachers. (iii) Primary Schools with <20 enrolment within 1 Km radius may be considered as Non-viable and consolidated with nearby existing school within 1 Km radius. (iv) The Primary Schools with less than 20 enrollment within 1 KM radius where there are no other schools within 1 K.M. radius may be continued. (v) After 340 student enrollment, for every 30 additional students, one additional SGT will be provided. (vi) On completion of the entire Rationalization exercise, if any working SGT are found surplus (rendered without work due to norms as given above) in the district, such teacher shall be allotted in the descending order to <80 enrolment primary schools wherever requirement is there as per norms given above. If after doing this exercise still surplus SGT post along with teachers are remaining, after filling up all posts in the needy schools, such surplus teachers shall be kept in the District Educational Officer’s pool for further utilization based on need. (vii) The LFL HM posts shall be provided to the Primary Schools having student enrolment of 131 and above. Where L.F.L. H.Ms are working in the schools having 130 and below the strength and not covered under compulsory transfer. Such LFL HM post may be adjusted against the justified SGT post in that school. Such LFL H.M. post may be treated as SGT in that school. (viii) On Rationalization of schools where SGT is rendered without work, as the school is getting merged with other schools, the junior most SGT in that School shall be preferably be transferred to schools where vacancy has arisen due to student teacher norms, or as per other transfer norms. (ix) All efforts should be taken to reduce single teacher schools in the district through appropriate consolidation of Primary Schools. (x) In Scheduled area, Schools with less than 10 enrolment may be continued, if no scope for the consolidation. (xi) Where there are both media in a Primary School, teachers shall be provided as per the justification for each medium based on enrolment. (xii) Schools in SC/ST areas which are specially located for them and where there are no schools in vicinity, schools which are separated by natural barriers hillock, water bodies, streams (vagus) shall not be consolidated. (xiii) Urdu medium schools shall be consolidated with other Urdu medium schools, if possible. Note: In scheduled Area, the slab <30 and 31-100 shall be read as <20 and 21-100 respectively. Note - In scheduled Area, the slab <40 and 40-140 shall be read as <30 and 30-140 respectively. 420 student enrollment, one additional School Assistant post for every 35 additional enrollment of students may be provided in the order of SA (Maths), SA (English), SA (First Language), SA (SS), SA (BS) and SA (PS). (iv) The Upper Primary Schools VI & VII and VI to VIII Classes with <30 and <40 enrolment respectively may be downgraded as Primary Schools. The students may be accommodated in the nearby High Schools / U.P. Schools within 3 KM radius. (v) Recommended Staff Pattern for Upper Primary Schools shall be on the basis of norms indicated in Table II-A & B. (vi) Upper Primary School having VI & VII classes with enrollment of 60 and above can straight away be upgraded into a full-fledged High School from 2017-18 onwards by opening VIII class, subject to availability of required infrastructure facilities in the school. Such school shall be provided staffing pattern as indicated in Table II (B). Necessary proposals shall be submitted. (vii) Elementary cycle Upper Primary Schools having VI to VIII classes with enrollment 80 and above can straight away be upgraded into a full-fledged High School from 2017-18 year onwards by opening class IX, provided there is no High School within 3 K.M. and there is availability of required infrastructure facilities in the school. Necessary proposals shall be submitted. (viii) Wherever a High School / Upper Primary Schools is available within 3 KM radius from the existing UP school point, the Upper Primary classes shall be consolidated with the nearby High School / Upper Primary School. (ix) On downgrading an U.P. School, if the strength of such a Primary School is 80 and above, it shall be treated as Model Primary Schools. Five SGTs are to be allotted to such school. (x) In case required SA posts are not provided to U.P. Schools as per Table II A & B due to non-availability of surplus sanctioned posts, surplus SGT post may be allotted to ensure comprehensive instructions in the school. (xi) The staff pattern for Primary Sections in Upper Primary Schools shall be as per in Table – I. (i) The staffing pattern for High School shall be as indicated in Table III-A above, including Success Schools. (ii) Minimum staff to be provided to High Schools with 51-240 enrollment will be nine subject teachers. (iii) High Schools with enrollment slap crossing over and above 1200-1240 student enrollment, one additional School Assistant post for every 35 additional enrollment of students may be provided in the order of SA (Maths), SA (English), SA (First Language), SA (SS), SA (BS) and SA (PS). (iv) A High Schools with less than 50 enrolment shall be treated as non-viable. (v) For Success Schools with >= 50 enrolment in English Medium, the staff pattern as at Table III-B shall be adopted. (a) If the enrolment in either Telugu or English Medium is < 50, such schools may be consolidated to nearby Success High Schools or may be limited to a single medium in consultation with S.M.C. / S.M.D.C. of the school. Teachers (i.e.1 S.A. (Maths), 1 S.A (P.S), 1 S.A (B.S) and 1 S.A. (SS)) shall be provided, in addition to the staffing pattern defined in Table III-A. (c) If the enrolment in English Medium is >=141 to 240 the staff will be additionally provided as a separate Unit as per the Table III-A, except Head Master Post and Physical Education Teacher Post. (d) If the enrolment in English Medium in Success Schools is > 500, additionally 1 Head Master Post and 1 P.E.T. post will be provided exclusively for English Medium Success School for improving academic and administrative monitoring, where there are surplus Head Masters, they may be provided to setup separate English Medium Success Schools in descending order. i. There shall be minimum one SA 1st Language in Minor Medium. ii. The recommended staff pattern for additional provision of subject teachers in Minor Medium / Parallel Medium High Schools is as per Table III-B in addition to Table III-A. iii. For major medium enrolment for calculation of requirement of Teacher posts Table III-A and for Minor Medium enrolment Table III-B are to be followed in the Minor Medium / Parallel Medium High Schools.